As Dan points out, RTI was designed to provide additional intervention for students who weren’t performing up to grade level expectations, but didn’t qualify for special education. It reduced the demands for comprehensive testing, which were impossible for public school school psychologists to meet. However, it also caused any twice exceptional students to fall through the cracks. The issue is a common one for dyslexic students – perhaps because of the higher order critical thinking and creative skills of dyslexic wiring, but also a mismatch in many public school curricula that emphasize rote and procedural skills. For a great read, check out Critical-Issues Facing Gifted Twice Exceptional Students and join our Stealth Dyslexia group. 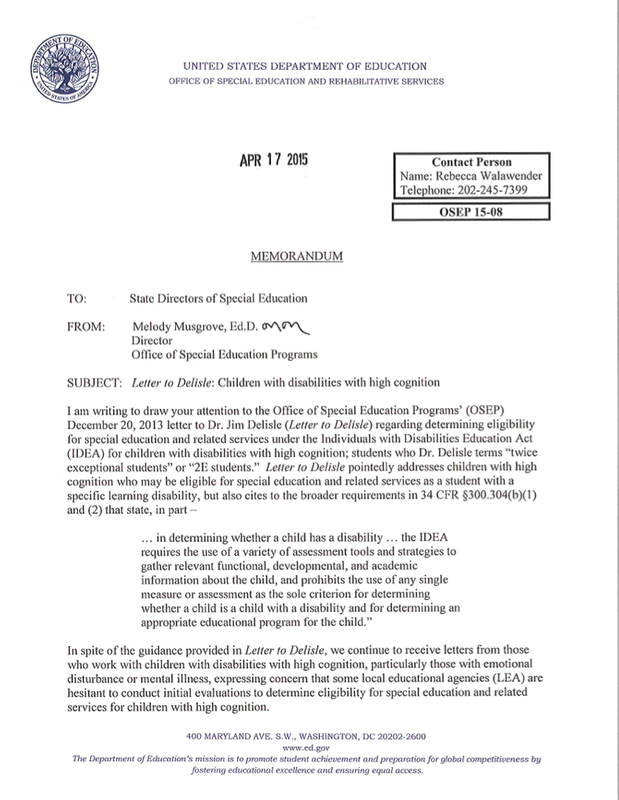 Just last week, we received an email from a parent concerned that her daughter’s school was trying to exit her from an IEP / 504 as she was to begin high school. The problem with making this decision between 8th to 9th grade is that the expectations ramp up dramatically in high school, and 9th grade is often the pivotal year when students need their Dyslexia and Dysgraphia designations to apply for accommodations for College Entrance Exams like the SAT, ACT, and AP exams. Waiting for a child to fail in 9th grade without appropriate supports can result in consequences that are hard if not impossible to reverse. For the student who is both gifted and dyslexic, an appropriate education is differentiation for giftedness and differentiation for dyslexia. Demonstration of an ability-achievement discrepancy through comprehensive testing is an essential requirement for the designation of 2E or twice-exceptionality. What an appropriate education looks for gifted dyslexic students looks like on a daily basis may vary dramatically for a particular student, but in our clinic we have often been able to see “best fits” with these students placed in gifted classes with appropriate accommodations. Do you have a 2E student? What are your experiences? What have you learned? My son is in the 5th grade with a verbal IQ of 130. He is dyslexic with ADHD. I knew that the school didn’t use the term dyslexia, but did not realize that the school wasn’t acknowledge it at all. He was given a D in music class for not showing enthusiasm for a presentation. I spoke to the teacher and found out through her that his dyslexia/ADHD was not in his IEP at all. Is this familiar to anyone? Also, I think it is significant that he has such a high verbal IQ and shouldn’t be totally ignored which it has been. Shouldn’t the school acknowledge all of these things? How do I get them to actually help him? When our son was in elementary school the teachers told us that he was a little behind but not badly and that was typical for boys. He would catch up later. In high school I pushed for testing and was told that he was not performing low enough to qualify for testing. A math teacher he was fortunate to have felt that he was gifted in math and encouraged him and worked with him and recognized that he made “careless errors” that she felt were not his fault. She also requested testing. She said that he was bright but there was something going on. They still would not test him. I called the state education department and one worker told me she would help. She must have talked with someone at the high school because she called me back and told me that she had not realized he was taking AP physics and that since he was taking an AP course she would not support my efforts to have my son tested. It did not seem to matter that he was struggling in physics class. After he graduated from high school we took him to a testing center where he was found to have quite a high IQ and be quite dyslexic. Wish we had gotten the diagnosis and help when he was younger.